Eating right is important for every mountaineer. For some, planning for the meal is one of their least priorities. The purpose of this post is to educate everyone and also to give importance for the meal preparation. In meal preparation, it should be well planned, prepared and proper nutrition is highly considered. Not eating enough nutritious food can lead to dizziness, cramps, nausea and a feeling of malaise. In meal planning we should consider the weight, preparation time, nutritional value, trash generation, how durable the food is when stored, price and finally the taste. We strongly recommend carrying a variety of our top ten favorite outdoor foods to spice up your mountain experience. Top 10- Tuna and Crackers. Make sure you get one of the smaller cans of tuna that has a pull top to open, that way you won't need a can opener. Nutritional pluses, tuna is almost pure protein while being balanced with carbohydrates from the crackers or bread. Top 9- Candy Bars and Jelly Ace. 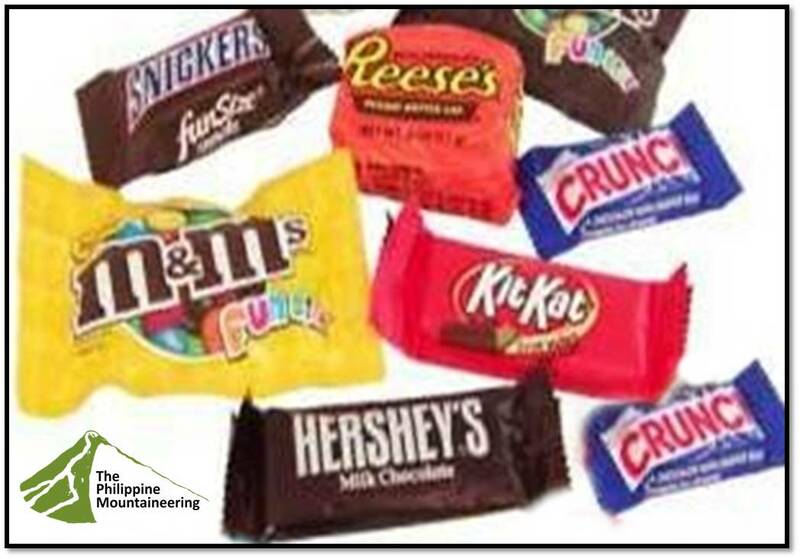 If you are hiking in a moderate climate, candy bars can survive well on the trail. We don't recommend them in hotter conditions. Pluses include lots of simple carbohydrates for a quick energy fix and great flavor that almost everyone loves and of course almost no trash to pack out. Top 8- Fresh Fruits. Nothing satisfies like a good apple, banana, dalandan, orange or pear. We recommend carrying fruits that can take rolling around in your backpack. Remember bringing fresh fruits means additional weight to carry and trash need to pack out. Top 7- Dried Fruits. Dried fruits are better than fresh fruits because they are more durable, there is a lot less trash to pack out. Raisins, dried cranberries, dried pineapple and dried mangoes were favorites. Some of the dried fruit bite products in the supermarket are extremely tasty, taking an assortment of dried fruits and cutting them finely. Dried fruits are packed with carbohydrates and offer a quick energy fix. Top 6- Granola. The availability of granola to the local market makes the mountaineering community enjoy the benefits of foreign trail food. This food is almost bullet proof. Granola has grown up and comes in a variety of flavors ranging from honey and nuts to more exotic combinations like blueberries or cherries. 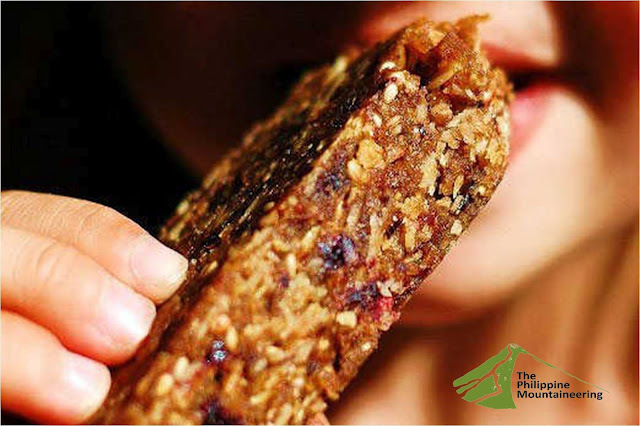 Loaded with fats and carbohydrates, granola is an excellent food source out on the trail. Top 5- Dried Fish/ Meat. 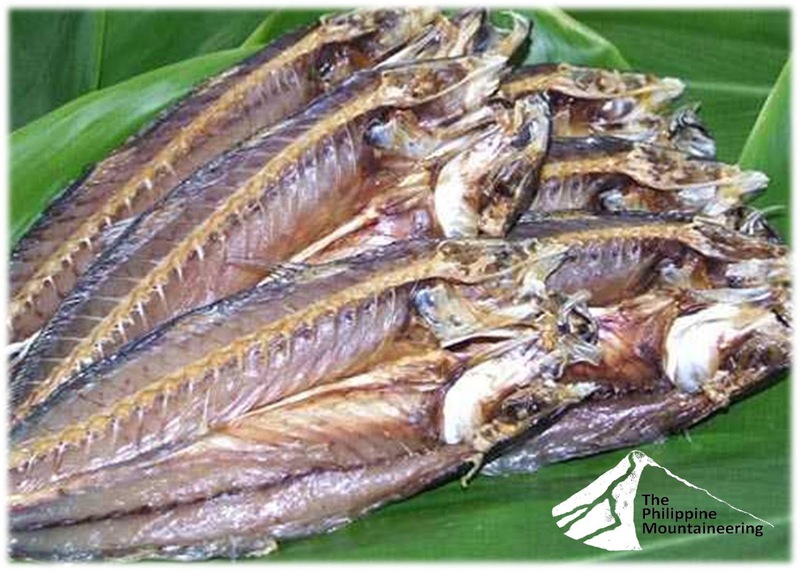 Filipinos really enjoy eating dried foods (e.i. tapa, tuyo, daing) as part of our meal. Having this lightweight foods with enough amount of oil means satisfying gastronomical mountain experience. This dried foods is ideal to be with tomato or with the combination of onion. Through world's oldest known preservation method, the need of our body for calcium, protein and enough sodium supply can be satisfied. Top 4- Soups. This is a quick, hot meal that offers plenty of health benefits. You can throw a variety of ingredients into a slow cooker in the morning before trekking. Soup is also one of the special recipes we can share to our co-mountaineers. Today, we have numerous labels and varieties of soup available to the market but we suggest cooking your own recipe as the best option. The healthiest soup includes fresh, low-fat ingredients and a minimum of salt and extra fat. Top 3- Adobo. This Spanish named dish was been part of the mountaineering history. Typically, pork or chicken, or a combination of both (called as CPA or Chicken Pork Adobo), is slowly cooked in vinegar, crushed garlic, bay leaf, black peppercorns, and soy sauce then browned. It has been called the quintessential Philippine stew. It can be serve as breakfast, lunch and dinner. It keeps well without refrigeration, due to one of its primary ingredients, vinegar, which inhibits the growth of bacteria. Bringing cooked Adobo saves fuel, water and cooking time. Top 2- GORP. 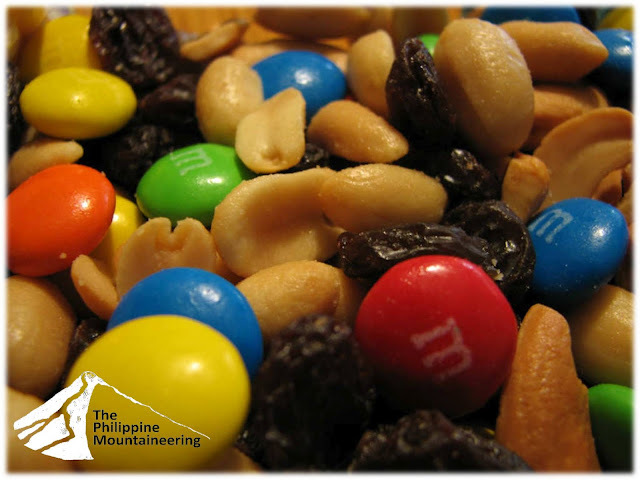 The best food on the trail, also known as trail mix. GORP means "gold old raisins and peanuts" but you can also make it with the combination of any of your favorites including M&M's, chocolate chips, marshmallows, cereal, cashews and dried coconut (bukayo). Low cost considering you probably have most of the ingredients sitting on the shelf at home, no trash to speak of, tasty if you make it from your favorites and bullet proof. GORP is the perfect food when you're out on the trail. Top 1- Rice. 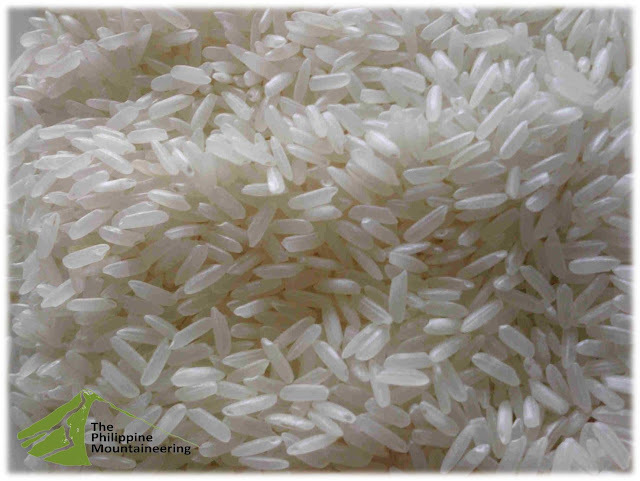 Rice is the staple food of the country and an important cereal crop that can satisfy the gastronomical needs of every Filipino mountaineer. For some, they tend to climb without rice but we suggest bringing the appropriate amount for every climb schedule. We should consider the benefits of consuming rice in the mountain. The known health benefits of rice includes providing fast and instant energy, good bowel movement, stabilizing blood sugar levels and providing essential source of vitamin B1 to our body. Other benefits of this wonderful grain include skin care, resistance to high blood pressure, dysentery and heart diseases. thanks for sharing this. i will ensure that our future climbs will be with good source of nutrients. Article is well written. Very informative and very helpful.